2018 Hyundai Elantra in Jacksonville FL, at Hyundai of Orange Park. Owning a sedan is more than just owning a vehicle that can get you from point A to point B, especially if you're behind the wheel of the Hyundai Elantra. This stunning sedan combines the sophistication and comfort features that you desire with the power, fuel-efficiency, and technology that you need and will make your drive, whether it be doing errands around Jacksonville FL or a longer road trip outside of the Sunshine State, enjoyable and relaxed. The Elantra not only comes in six outstanding trim levels, but it also has three different powertrains available. The 2.0-liter four-cylinder engine, which offers plenty of fuel-efficiency and power, comes standard in four out of six trims, with the Sport and Eco packing different engine and performance features. 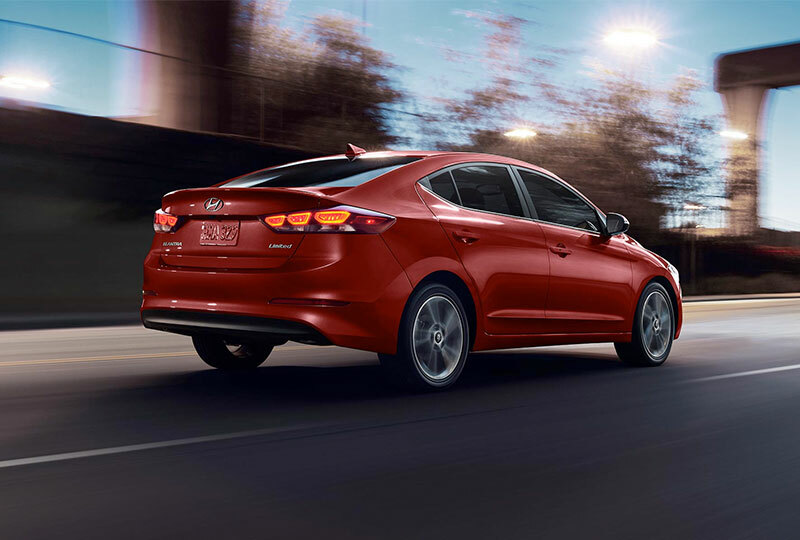 For more power, you'll want to check out the Elantra Sport, with its 1.6-liter Turbocharged GDI four-cylinder engine that offers you up to 201-horsepower, and for a more eco-friendly option you'll want to take a closer look at the Elantra Eco, which gains an EPA estimated 32/40/35 city/highway/combined miles-per-gallon rating with its 1.4-liter Turbocharged GDI four-cylinder powertrain. No matter which powertrain or trim level you choose, you'll love the way the Elantra handles the curves and straightaways through Ponte Verda Beach and Middleburg FL. Its body uses high-tensile strength steel to protect passengers in the event of a collision and thicker front side window glass for a quieter cabin. Bluetooth hands-free phone system, cruise control and a 60/40 split-folding rear seatback are all standard. In the category of why didn't someone think of this sooner comes this handy feature for anyone who's ever carried an armful of stuff to the car, which is pretty much everyone. It senses the key fob approaching and, voilà, the trunk automatically pops open so you don't have to fish keys out of you pocket with your hands full. You can never understate the need for better safety. 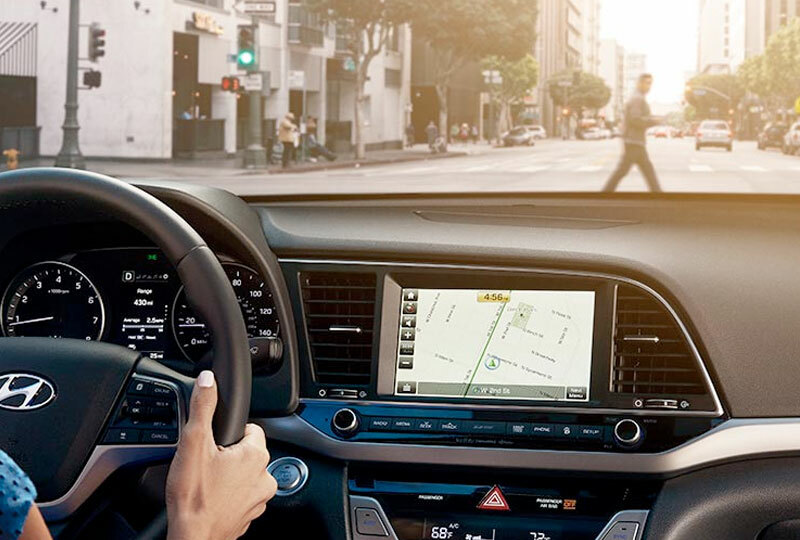 So, for added peace of mind, this available cutting-edge safety feature acts as your trusty co-pilot that's always on duty, automatically stopping your forward progress when it senses a collision is imminent when your attention is elsewhere. It's also a must-have feature when sharing your Elantra with younger, less-experienced drivers. MSRP excludes destination charges, tax, title, and license fees. Destination charges and actual dealer prices may vary. Vehicles displayed may contain optional equipment at additional cost. 2018 Elantra SE: 29 City/38 Hwy/33 Combined A/T, 26 City/36 Hwy/29 Combined M/T. 2018 Elantra SEL/Value Edition/Limited: 28 City/37 Hwy/32 Combined A/T. 2018 Elantra Eco: 32 City/40 Hwy/35 Combined DCT. 2018 Elantra Sport: 22 City/30 Hwy/25 Combined M/T. 2018 Elantra Sport: 26 City/33 Hwy/29 Combined DCT. EPA estimates. For comparison only. Your actual mileage may vary with options, driving conditions, driving habits and vehicle's condition. Automatic Emergency Braking (AEB) with Pedestrian Detection detects pedestrians, but not in all conditions. The system initiates full braking at speeds between 5-28 mph when a pedestrian is standing, or from 5-43 mph when a pedestrian is moving. AEB is not a substitute for safe driving. See Owner's Manual for details and limitations. The smart trunk will open when the smart key is within 40 inches of the detection area for at least 3 seconds. Radio transmitters and other vehicle smart keys may interfere in normal operation of the feature. Please consult Owner's Manual for further details. Make sure you close the trunk before driving..
From the beginning, the Elantra is designed to keep you safe. Besides its strong frame and wide array of perfectly placed airbags, you can also find many different enhancements, such as the aircraft-quality adhesives, thicker glass in the front windows, sound absorbing materials, and much more. While these additions are great for protecting you when an accident occurs, a multitude of available safety programs, including Automatic Emergency Braking with Pedestrian Detection, Blind Spot Detection with Rear Traffic Alert, Rearview Camera with Dynamic Guidelines, and Lane Departure Warning with Lane Keep Assist, can be added to help prevent the collision from occurring in the first place. These technological safety features will monitor the road around you, alert you to potential incidents, and some will even brake for you if a collision is about to occur. Whether you're in the busy traffic of Jacksonville or you're cruising through Fruit Cove and someone pulls out in front of you, the Elantra has your back. Sometimes it's the details that make all the difference, especially when it comes to picking out a new car. The Hyundai Elantra contains many features and amenities that may push into its direction. 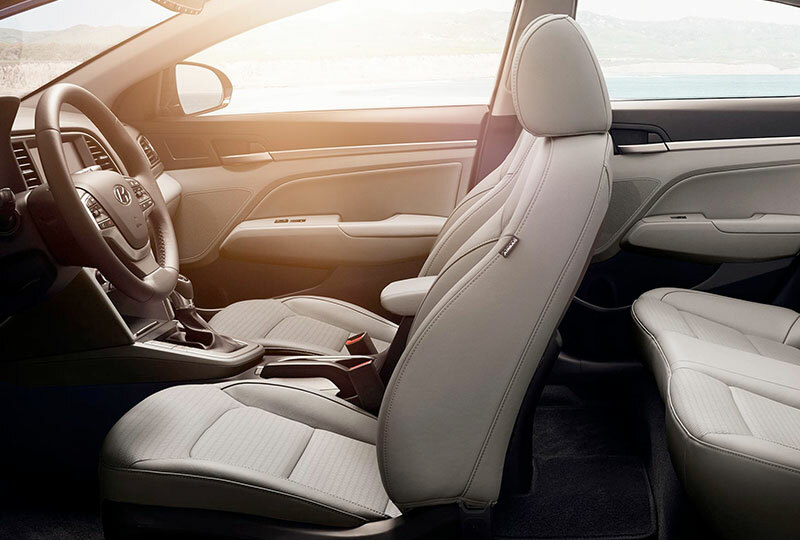 Easy Access Seating With Integrated Memory Driver Seat - Sometimes it's difficult to get in and out of a lower vehicle, but not the Elantra. The Easy Access Seating feature moves the seat back when it's time for you to exit or enter the vehicle, and will then move the seat forward to your specific driving position when it's time to go. The Integrated Memory Driver Seat will also adjust, based on who the driver is, making your drive as comfortable and relaxed as it can be. Dynamic Bending Light - When you're driving around Orange Park in the dark, most headlights stay straight around the corners, which doesn't provide you with the greatest lighting. The Elantra's Dynamic Bending Light will move when you turn to keep every inch of roadway illuminated. Hands-Free Smart Trunk - There is nothing worse than trying to put stuff into your trunk with your hands full. Don't fiddle around trying to find your keys. Simply stand behind the trunk, with the key fob tucked in your pocket or purse, and it will open for you automatically. If you'd like to learn more about what the Hyundai Elantra has to offer, feel free to stop by our Hyundai of Orange Park dealership. We have a wide array of new Hyundai Elantra models in stock and would love to find you the one that would best match your wants and needs today!